National liturgical calendars are a bit of an ahistorical recent development—calendars should ideally be drawn up at the diocesan level, as they were for centuries—but as the national versions are for better or worse the current modus operandi, I would respectfully ask the USCCB to consider adding St. Benedict the Moor to the liturgical calendar of the United States. True, St. Benedict had no living connection to America, having spent his days around Palermo in Sicily. 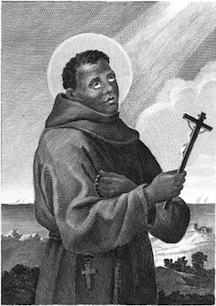 But since the 1600s he has been arguably the most important saint of the African diaspora. His cultus spread rapidly out of Italy primarily thanks to the fervent devotion of African Catholics, and their celebrations in his honor were so remarkable that they were even attended by King Philip III of Spain in 1618. 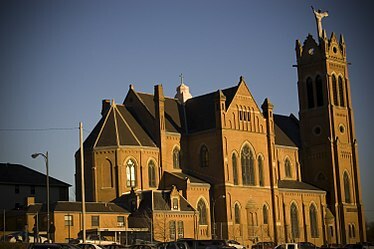 In this country specifically, black missions, parishes, and religious orders in America have placed themselves under Benedict's patronage for nearly two centuries. In 1833 the Oblate Sisters of Providence in Baltimore even gained a plenary indulgence from Rome for all who celebrated his feast in their chapel. St. Benedict the Moor, Pittsburgh, built in 1894. Currently there are 11 majority-black parishes named after him in America, and these parishes are able to commemorate him liturgically because of that patronage. But there are also many, many more majority black parishes that are not named for him. And there are likely other parishes and priests around the country who would gladly honor him yearly at the altar of sacrifice. Making April 4th an Optional Memorial of St. Benedict the Moor in the United States would seem to be a good first step. We would be following the examples of Nigeria, Ghana, Kenya, and South Africa as well as the Franciscan order of Friars Minor. To be sure, April 4th is repeatedly overshadowed by either Holy Week or Easter Week, so if that proves a sticking point, another suitable date could certainly be found; Brazil has Benedict's feast on October 5th, for example. But given that the yearly remembrance of Martin Luther King's assassination also falls on April 4th, perhaps we in the U.S. would be foolish to not make use of such a striking coincidence. In any case, there is no good reason to allow such a historically important feast day to simply fade away because of our own neglect or indifference to tradition. The long devotion that black Americans have had to this great saint ought certainly to be reflected in our national calendar. Spend a little time on the Catholic "mommy blogs" geared toward living the liturgical year at home, and you'll find many suggestions to make your March 17th more Irish, your December 12th more Mexican, and your December 13th more Swedish. It would be wonderful if all American Catholics could join in celebrating April 4th likewise, with the same affection for the sons and daughters of the African diaspora.